Background The combination of spinal manipulation and various physiotherapeutic procedures used to correct the curvatures associated with scoliosis have been largely unsuccessful. Typically, the goals of these procedures are often to relax, strengthen, or stretch musculotendinous and/or ligamentous structures. In this study, we investigate the possible benefits of combining spinal manipulation, positional traction, and neuromuscular reeducation in the treatment of idiopathic scoliosis. Methods A total of 22 patient files were selected to participate in the protocol. Of these, 19 met the study criterion required for analysis of treatment benefits. Anteroposterior radiographs were taken of each subject prior to treatment intervention and 4–6 weeks following the intervention. A Cobb angle was drawn and analyzed on each radiograph, so pre and post comparisons could be made. Results After 4–6 weeks of treatment, the treatment group averaged a 17° reduction in their Cobb angle measurements. None of the patients' Cobb angles increased. A total of 3 subjects were dismissed from the study for noncompliance relating to home care instructions, leaving 19 subjects to be evaluated post-intervention. Conclusions The combined use of spinal manipulation and postural therapy appeared to significantly reduce the severity of the Cobb angle in all 19 subjects. These results warrant further testing of this protocol. In the MEDLINE- indexed literature, chiropractic treatment has shown to be largely ineffective at significantly reducing scoliotic curvatures. Chiropractic treatment for scoliosis typically consists of spinal manipulation, electric stimulation, some form of isotonic, active exercises, and shoe lifts. However, Lantz et al  has shown that these procedures, when applied over a one-year duration, were not sufficient to significantly reduce the Cobb angle of a scoliotic curvature. The treatment in this study focuses on the reduction of scoliosis by manipulative and rehabilitative methods not commonly used by most chiropractors. 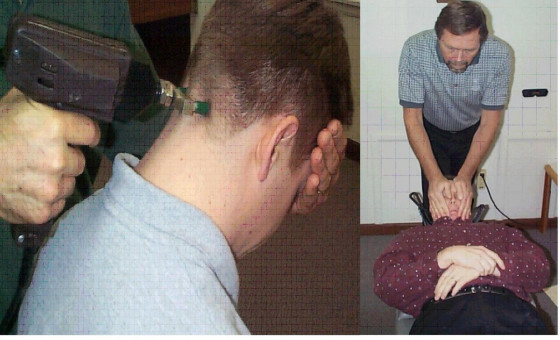 The major difference in this treatment compared to others is that stimulation of the involuntary postural reflexes is utilized in the clinic setting as well as in home care. Many of the proposed etiologies of idiopathic scoliosis are neurological in origin, including brain asymmetry , neural axis deformities , and central nervous system processing errors. Additionally, many coexistent neurological alterations are present in scoliosis patients, such as visual deficiency  and decreased postural stability. [7, 8] Therefore, the goals of the proposed treatment are not only to reduce the scoliotic curvatures, but also to rehabilitate any underlying postural and neurological weaknesses or imbalances. Previous chiropractic authors have investigated the effectiveness of various physiotherapeutic modalities in the treatment of scoliosis, such as Pilates,  stretching and massage,  therapeutic exercises,  orthotics,  and ultrasound or electric stimulation. The purpose of the present study is to investigate any possible benefits from combining manipulative and rehabilitative techniques from a randomized sample collected from various chiropractic facilities. Preliminary evidence  suggests that these procedures may be beneficial for reducing the curvatures associated with scoliosis. Each patient was examined radiographically for location and severity of scoliosis with standing anteroposterior full spine imaging. All patients removed their shoes for the imaging. Cobb angles were drawn on each radiograph to identify the degree of curvature present. A specific treatment plan was created based upon the results of each patient's radiographic measurements before and after a sample trial of the proposed clinical procedures. Initially, standing lateral cervical, nasium, lateral lumbar, and anteroposterior lumbopelvic views were taken. These views were taken to quantify forward head posture, cervical lordosis, lumbar lordosis, the sacral base angle, and the Cobb angle of the major lateral curvature. We decided to use the radiographic positioning and analysis outlined by Harrison et al, [13–16] due to its previously published reliability. After these images were taken, each patient was fitted with a 4–lb anterior headweight. They were instructed to walk around with the headweight for 10 minutes. After 10 minutes, a follow-up lateral cervical radiograph was taken while wearing the anterior headweight. The purpose of this lateral stress view is to evaluate the potential improvement in cervical lordosis and reduction in forward head posture from using these procedures. [17, 18] The basis for this aspect of the protocol is based upon the inherent properties of a curved column. In the spine, lateral spinal displacements may occur when the normal sagittal spinal curves [19–22] are flattened, reversed, or accentuated. These curves are necessary for the overall strength and flexibility of the curved spinal column, according to the Delmas Index. Therefore, the proposed treatment is intended to restore a normal cervical and lumbar lordosis, and reduce forward head posture before the scoliotic curvatures are addressed. The manipulative procedures included an upper cervical adjustment designed to mobilize the atlantal-occipital joint with the use of a percussive instrument. This technique is shown in Figure 1. 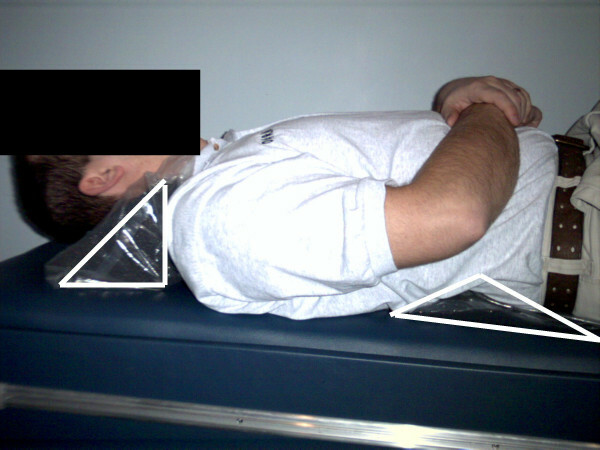 This technique is delivered to patients whose lateral cervical radiographs demonstrated atlanto-occipital flexion. If atlanto-occipital extension was present on the initial lateral cervical radiograph, a -Z drop piece was used to mobilize the occiput into flexion. This is also shown in Figure 1. An anterior thoracic adjustment was administered with the patient's thoracic cage rotated opposite to the rotational displacement. A thoracic drop piece was also used to mobilize and correct the smaller upper thoracic curvature. Side posture lumbopelvic adjustments were delivered bilaterally to correct the rotational component of the pelvic misalignment. These side-posture manipulations were performed on a 30°-incline bench to help pre-stress the spine out of its existing scoliotic curvatures. Figure 1. The picture on the left demonstrates the mechanically assisted manipulation used when a patient's skull is restricted in extension on lateral cervical radiograph. The picture on the right is the procedure used when the skull flexion is restricted. Certain traction procedures are also employed. These procedures are delivered using high-density foam blocks to pre-stress the spine into specific positions so ligament deformation and stress-relaxation can take place. Supine pelvic blocking was performed on each patient for 15 minutes. The position of the blocks was determined by each patient's pelvic rotation on radiograph and posture analysis. One block is placed under the iliac crest of the posterior ilium, and the other block is placed under the femoral head of the opposite, anteriorly-rotated ilium. 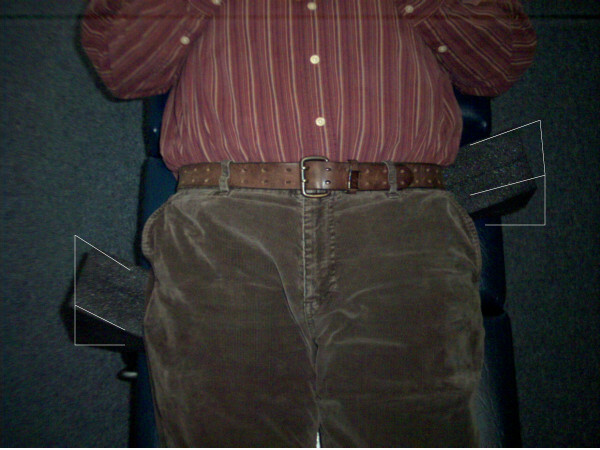 Figure 2 illustrates the position of the pelvic blocks. 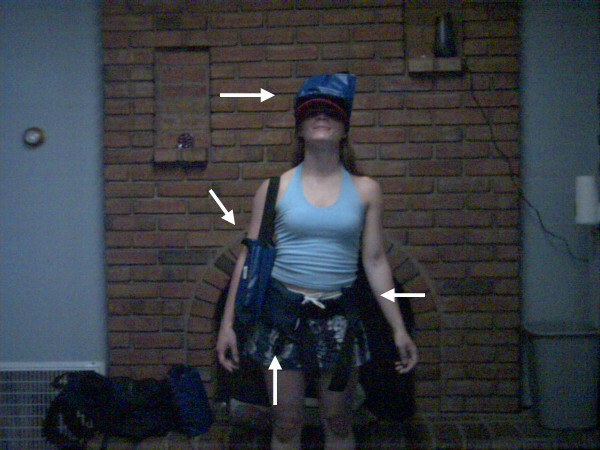 The rehabilitative procedures, demonstrated in Figure 3, included the use of head, shoulder, and hip weighting devices. These devices may be used while simultaneously performing specific balancing exercises. These exercises include the use of a Pettibon Wobble Chair® and a Posturomed®. Tjernstrom et al  showed that repeated performance of a postural alteration induces a long-term motor memory for achieving that novel postural position. The position of the body weighting was also determined radiographically for each patient. Initially, hipweights and shoulderweights were applied according to each patient's posture analysis. Anteroposterior cervicothoracic and lumbopelvic views were taken while wearing the head and body weighting. Since changes in spinal position are not reliably seen by visualization, [28, 29] these stress radiographs were taken to confirm their corrective effects. Figure 4. This figure shows a demonstration of the positional traction procedure. The cervical block is placed under the patient's cervicothoracic junction, allowing the head to extend back over the sloped portion of the block. The low back support is placed under the patient's thoracolumbar junction, posterior to the lowest palpable ribs. The blocks are outlined in white. The outcome measures for this study are divided into a series of both short-term and long-term goals. The outcome of the initial stage of care is to reduce forward head posture and improve the sagittal cervical and lumbar curves. As the position of the head migrates forward, or away from the body's vertical axis, increased strain is placed upon the muscles of the head, neck and shoulders. Cailliet and Zohn indicated that an additional 10 inch/lbs of leverage is added to the spinal system in a forward head posture [41,42]. Additionally, this added leverage causes increased isometric contraction of various spinal muscles, such as the splenius capitis, trapezius, SCM, and levator scapula. Sjogaard et al  reported that blood flow through a given muscle is decreased as a muscles contraction increases, being virtually cut off at 50–60% contraction. The resultant lack of blood flow forces the muscle to rely on anaerobic metabolism. As anaerobic metabolism progresses, metabolites such as substance P, bradykinin, and histamine build up and excite chemosensitive pain receptors, causing a barrage of nociceptive afferent input , resulting in dysafferentation . Being that postural control is largely dependant upon cervical joint mechanoreceptors and afferent input from ligament and musculotendinous sources [46,47], correcting the postural distortions responsible for this pathophysiologic process may be beneficial in patient populations, such as scoliosis, where postural control is significantly altered . The effects of the loss of cervical and lumbar lordosis have been previously reported [19, 35–37]. Rhee et al  noted that correction of the sagittal curves might be related to the long-term health of the spine in scoliosis management. Harrison et al  illustrated how a loss of the sagittal curve alters the mechanical properties of the spinal cord and nerve roots, which may change the firing patterns of involved neurons. Schafer illustrated how an increased demand is placed upon the cervical musculature when the cervical curve is straightened or reversed . It is important that the cervical spine be in a normal structural alignment. A loss of the cervical lordosis and concomitant forward head posture may elicit the pelvo-ocular reflex, which causes an anterior pelvic translation to balance the head's center of gravity . Wu et al [52,53] point out that in postural control, preference is given to the position of the head, neck, and trunk. Therefore, correction of the cervical spine becomes imperative so that the rest of the spine can be rehabilitated in relation to a normal reference point in space. Once the cervical and lumbar lordoses are corrected, coronal reduction of the scoliotic curvatures begins. Here this was accomplished by adding a shoulderweight to the right shoulder and a hipweight to the anterior right ilium and posterior left ilium. Wu and Essien  have previously reported the effects of adding external weight to the upper body via a shoulder weight. They identified predictable patterns in which the trunk would compensate for the amount and position of the weight. Wu and MacLeod  identified a shift in the center of mass toward the added weight when placed on the side of the pelvis. However, the trunk and head remained in the same position, while the pelvis and lower extremities shifted to counteract the weight while supporting the head and trunk . In this protocol, we created an environment where external weight was added to the head, shoulder, and pelvic regions simultaneously. Knowing the predictable patterns of compensatory shifting to an altered center of gravity, we placed the headweight, shoulderweight, and hipweights in areas designed to reduce each patient's specific spinal distortion patterns. Within the design limitations of the present study, the combined use of manipulative and neuromuscular rehabilitation seemed to reduce scoliotic curvatures in 19 subjects by an average of 17°. This reduction took place within a 4 to 6–week period. Although this treatment was not tested over the long term, the magnitude of the present results warrants further studies into its effectiveness. This treatment should also be tested on specific types of scoliosis in follow-up trials. A long-term investigation of this protocol is desirable. An inquiry into chiropractors' intention to treat adolescent idiopathic scoliosis: A telephone survey. Effect of chiropractic intervention on small scoliotic curves in younger subjects: a time-series cohort design. The potential role of brain asymmetry in the development of adolescent idiopathic scoliosis: a hypothesis. Prevalence of neural axis abnormalities in patients with infantile idiopathic scoliosis. Relations between standing stability and body posture parameters in adolescent idiopathic scoliosis. The postural stability control and gait pattern of idiopathic scoliosis adolescents. Scoliosis reduction utilizing an exercise. Idiopathic Scoliosis Treatment Using the Pettibon Corrective Procedures: A Case Report. Repeatability over time of posture, radiograph positioning, and radiograph line drawing: an analysis of six control groups. Chiropractic biophysics digitized radiographic mensuration analysis of the anteroposterior lumbopelvic view: a reliability study. Chiropractic biophysics lateral cervical film analysis reliability. Chiropractic biophysics digitized radiographic mensuration analysis of the anteroposterior cervicothoracic view: a reliability study. Improvement of cervical lordosis and reduction of forward head posture with anterior head weighting and proprioceptive balancing protocols. Spinal manipulation and anterior headweighting for the correction of forward head posture and cervical hypolordosis: a pilot study. A normal spinal position: it's time to accept the evidence. Evaluation of the assumptions used to derive an ideal normal cervical spine model. Can the thoracic kyphosis be modeled with a simple geometric shape? The results of circular and elliptical modeling in 80 asymptomatic patients. Elliptical modeling of the sagittal lumbar lordosis and segmental rotation angles as a method to discriminate between normal and low back pain subjects. The physiology of the joints. The trunk and vertebral column. Volume 3. 5th edition. Cervical hyperlordosis correction: a novel treatment method for mid thoracic pain. Strength gains through lumbar lordosis restoration. Adaptation of postural control to perturbations- a process that initiates long-term motor memory. The correlation between surface measurements of head and neck posture and the anatomic position of the upper cervical vertebrae. Reliability of the visual assessment of cervical and lumbar lordosis: how good are we? 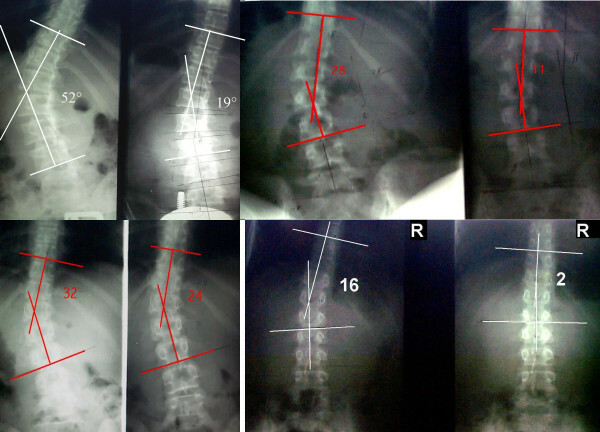 Results of surgical treatment of adult idiopathic scoliosis with low back pain and spinal stenosis: a study of long-term clinical radiographic outcomes. Radiologic findings and curve progression 22 years after treatment for adolescent idiopathic scoliosis: comparison of brace and surgical treatment with matching control group of straight individuals. Quality of life in women with idiopathic scoliosis. Health and function of patients with untreated idiopathic scoliosis: a 50-year natural history study. A review of biomechanics of the central nervous system- part III: spinal cord stresses from postural loads and their neurologic effects. A review of biomechanics of the central nervous system-part II: spinal cord strains from postural loads. A review of biomechanics of the central nervous system-part I: spinal canal deformations resulting from changes in posture. The natural history of scoliosis: curve progression of untreated curves of different aetiology, with early (mean 2 year) follow up in surgically treated curves. The efficacy of cervical extension-compression traction combined with diversified manipulation and drop table adjustments in the rehabilitation of cervical lordosis: a pilot study. Structural Rehabilitation of the spine and posture: rationale for treatment beyond the resolution of symptoms. In Neck and arm pain. 2nd edition. Edited by Davis FA. 1981. In Musculoskeletal pain diagnosis and treatment. 2nd edition. Edited by Little Brown. 1988. Muscle blood flow during isometric activity and its relation to muscle fatigue. Myofascial pain and dysfunction: the trigger point manual. Dysafferentation: a novel term to describe the neuropathophysiological effects of joint complex dysfunction. A look at likely mechanisms of symptom generation. Effect of neck pain on verticality perception: A cohort study. Locomotor activity in spinal man: significance of afferent input from joint and load receptors. Influence of different types of progressive idiopathic scoliosis on static and dynamic postural control. Sagittal plane analysis of adolescent idiopathic scoliosis. Clinical biomechanics: musculoskeletal actions and reactions. 2nd edition. Muscular and articular factors in movement restriction. The control of body orientation and center mass location under asymmetrical loading. The regulation of human orientation and center of mass in the frontal plane during upright stance. Neurophysiologic, motor control, and motor learning basis of closed kinetic chain exercise. Orthop Phys Ther Clin N Am 2000, 9:137-149.